A foam cleaning block containing microscopic melamine fibres. 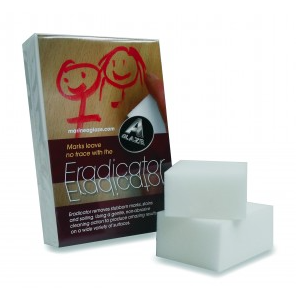 Used damp, the Eradicator sponge can remove even the most stubborn stains previously immovable. Chemical free and environmentally friendly, the melamine fibres gently break down the stain and remove it without the need for harsh detergents. Removes marks easily from a multitude of surfaces including Laminate flooring, ceramics, Upvc Windows, glass & cookware ( Not recommended for use on vehicle paintwork ). For even better results use with the Nano Clean Lubricant.